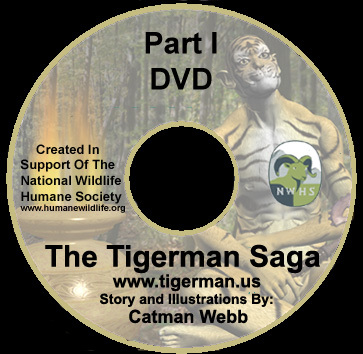 The Tigerman Saga Online - Click! has been created as an enhanced way to view the Saga. Intro through Chapter 15 (plus 3 Bonus "Abouts") appx. 90 minutes play time. It is narrated by the author, has background music and cool sound effects. or the DVD drive on your PC. for a contribution of $25.00+ to National Wildlife Humane Society. Make certain to include your return address. in case there are any questions concerning your donation. check to make sure first, if you are outside the USA. to calculate disk donation and P&H. PAL (Europe and Asia) video format. and include that information in your donation. We can provide your DVD either way. 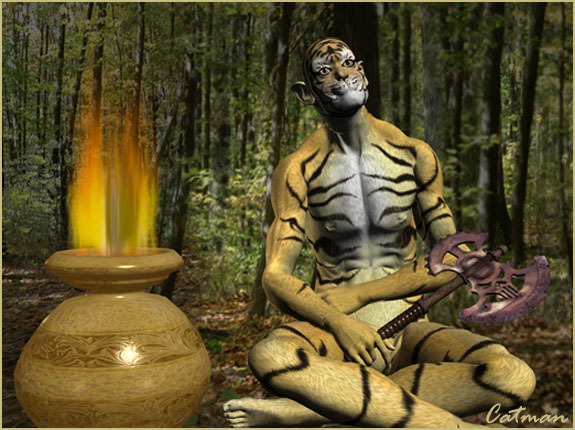 a sample of the Tigerman Show, right now? please consider a donation to assist Top Of The Rock. The button below will open the "National Wildlife Humane Society"
You may use your Paypal account, or use a Visa, Mastercard, American Express or Discover. it is NOT necessary to have a PayPal account. to create a PayPal account (in the event you ever want to unsubscribe). and numerous other important wildlife programs. merely refresh page each time you send. Interested in screensavers from the Tigerman Saga? There ar two. One with music, one without. They are free. Would you like to learn about Catman Webb's music work? You can also donate to NWHS/TOR and get a free music CD.